A new and very logical gematria cipher has recently been revealed and with it many amazing clues of the Torah have been deciphered. It is almost needless to say that it is only new to us, and is actually as ancient as Hebrew itself. This revelation is dedicated to the elevation of the soul of Chiel Mordechai Ben Abraham, may he study peacefully in the highest palaces. With these new revelations, more pieces of the grand puzzle of our universe fall neatly into place and heretofore-mysterious aspects of the Torah have become clear. This gematria cipher is quite simple compared to most of them and simply uses the 5 final letters in a slightly different way. The standard gematria sofit takes into account the larger values of the special 5 final letters of the Hebrew alef-bet (C= 500, M= 600, N=700, P=800, and Z=900) for a total of 3500, while their standard values are normally counted as (C= 20, M= 40, N=50, P=80, and Z=90) for a total of 280, but since the letters represent energy and energy is never lost, another way to count them includes both values, thus treating the final shaped letters as extensions of the originals for a total of 280 + 3500 = 3780. Many of you may recognize this as 10 x 378, the numerical value of the word chashmol, the angelic cloaking that is today known as electricity, but today we’ll look straight to the heart of the Torah’s structure and leave the numerous other application of this cipher aside for now. Bereshit (BREShYT), which is broken down to the prefix Bet (B) meaning “in” and REShYT meaning “Beginning.” The numerical value of REShYT is 911—yes, as in 9/11—but more germane is that utilizing the newly discovered ancient gematria, 911 represents the letter Alef. The letter Alef (ELP) is spelled out Alef-Lamed-Pe) whose numerical value is typically 1+30+80 or 111, but when we add in the 800 for the Pe sofit inclusive) we get 111 + 800 = 911, and thus the first verse of the Torah can be read as “In Alef G-d created Heaven and Earth. Likewise the new value for the 7th and final word in the verse, Earth, H’Aretz (HERZ) is 296+900+4 letters = 1200. So when we add “Heaven and Earth” together with the letter Vav(V), the prefix for “and”, we get (HShMYM V’HERZ) = 1000 + 1200 + 7 = 2207. This includes the kolel for each of the 10 letters in the phrase. 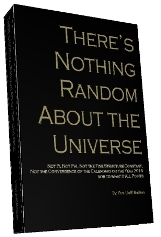 Now, to most people the number 2207 would be insignificant and random, but to readers of There’s Nothing Random about the Universe, the number 2207 represents 5778/phi2 or more specifically, exactly 2207.000 . First, the basics: 5778 is the Hebrew year given by Rav Yehuda Halevi Ashlag, and others for the geula, the final redemption; and Phi (1.61803398…) is the primordial mathematical constant that controls harmonic spiraling growth throughout our universe from the number of petals on our flowers to the shape of the Milky Way. Moreover, since 5778.000 is exactly phi18, then the number, or year, 2207.000 is precisely two iterations of Phi away from 5778.000. Observed geometrically, 5778 is exactly 2 turns of the spiral further along the cosmic spiral of time than 2207. The number 5778 is a natural harmonic progression of 2207; therefore, the Tree-of-life reality is a natural progression of “Heaven and Earth,” and the first verse of the Torah may have been designed to show us that. Since the letter Alef represent the 32 Paths of the Tree-of-Life and the 10 letters of “Heaven and Earth) also represent the 10 sefirot (dimensions) of the Tree-of-Life, we now see a hint that the Tree-of-life reality, which was present at the dawn of creation, will have to go through 2 more iterations (expansions) to reach the geula in 5778, which is in actuality no different than the tzaddikim have explained numerous times. After Adam, and the start of the 5778-year calendar, the next opportunity for the Tree-of-life consciousness came in 2448 at Mt Sinai, which was exactly 66.6 jubilee years before 5778, when the third cosmic opening for the Tree-of-life reality is destined to occur. And while probably just coincidental that 22/7 = 3.1428, a close approximation of Pi (3.14159…), through simple gematria the Torah’s 1st verse of 7 words and 28 letters yields an even closer approximation, 3.14155, as explained The Genesis Prayer. The important concept to keep in mind is the Torah as the nexus between the physical world that’s structurally guided by Phi and Pi and the spiritual world that’s guided by the Tree-of-life. Speaking of the Tree-of-life, Etz Chaim (AZ ChYYM), its numerical value, utilizing the newly revealed gematria, is 1728 and with 1 for the kolel it equals 1729, as in the 1729 words in the Torah that have a numerical value of 26, that of the Tetragrammaton (YHVH). And as for the Tetragrammaton (YHVH), there are 1820 of them in the Torah and 1820 just happens to be the numerical value, utilizing the new gematria, of the famous verse that Hillel and other sages have said encapsulates the entire Torah, Vayikra 19:18, paraphrased as “Love they neighbor as thyself,” which is the essence of the consciousness that will lead to the Tree-of-life reality. The number 1820 is not only 70 x 26, but it’s also the number of letters in the 28 prophetic verses of Ezekiel 37 about the “dry bones” and the geula in the end of days. You can add 19+18 in Vayikra 19:18 and get 37 and say “wow,” but a much bigger Wow! moment comes when we compare when we apply the newly revealed gematria to the collective words in the entire Torah. First of all, the standard gematria gives us a total value of 21009826 and while (2+1+0+0+9+8+2+6) = 28, as in the number of letters in the Torah’s first verse, the product of those same digits is (2*1*0*0*9*8*2*6) = 1728, as in the value of Tree-of-life using the new gematria. And just to keep us honest, another deeply revealing form of gematria gives us 4√(P(21009826)/ ∑(21009826)) = 4√(1728/28) = 2.802828, not so dissimilar from the square root of the exact number of words in the Torah, 282.8002828, but we’ve discussed elsewhere about 28 being a core Torah concept and won’t go further with it today, except to say that 28 x 26 (YHVH) = 616, the numerical value of “The Torah,” and the number of times Moses’ name (MShH) is mentioned in the Torah. Nevertheless, it’s when we apply the newly revealed gematria that we discover that the square root of the total gematria value (33640626) of the 304,805 letters in the Torah is 5800.0054, which is pretty astonishing considered that exact collective number of words, letters and verses in the Torah is exactly 58. And what ties these two gematria ciphers even closer together and ties them both to the main quantitative (or structural) elements of the Torah is that while the square root of 58, the sum of the words, verses, and letters in the Torah, is 625 and 5/8 = .625, and while 625 is the numerical value of H’Keter(“The Crown”) or highest and crowning sefira (dimension), 21009826/33640626 = .625 (approximately) = 5/8. Moreover, while the sum of the 22 spelled out Hebrew letters is 4248, it becomes 10048 when the final letters are considered in the spelling, in other words exactly 5800 more. Thus, it’s pretty obvious in these days of knowledge that the revelations of formerly concealed gematria ciphers are opening up whole new avenues of Torah exploration for us, and that simple names, like Abraham, whose value was 248, now take on new meaning for us as 848, or twice 424, which is the value of Moshiach Ben David. As revealed in The Divine Calendar the Covenant of Abraham (also knows as the Covenant of Halves) occurred in 2018 HC. And 2018 CE is the swiftly approaching Hebrew year 5778, the year dictated by the Torah’s structure, its gematria values and by the 22 letters of the Alef-bet. And in case you think this is all utter nonsense, ask yourself why then is it also the surface temperature of the Sun (5778 K). Did man create the Sun as well? Ask yourself this as well: If G-d’s Covenant with Abraham in 2018 was known as the Covenant of Halves, what is half of 848? You already know the answer in your heart: 424, Mashiach Ben David. We can close our minds to the depth of the Torah and its relationship to the underlying structure of the universe and G-d’s designs, or we can open them up and try to grasp the endless dimensions of the Tree-of-life reality. Either way, it’s through the burning desire of our hearts for the truth that will draw us closer to it. 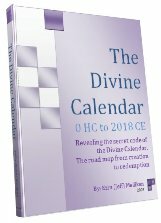 Since writing this post just a few days ago, many new ancient secrets have been revealed, which we hope to share shortly, including the 42 letters of the Tree-of-Life hidden write under our noses, and a new and very specific clarification to the Zohar’s lengthy discussions about the end-of-days (final redemption).